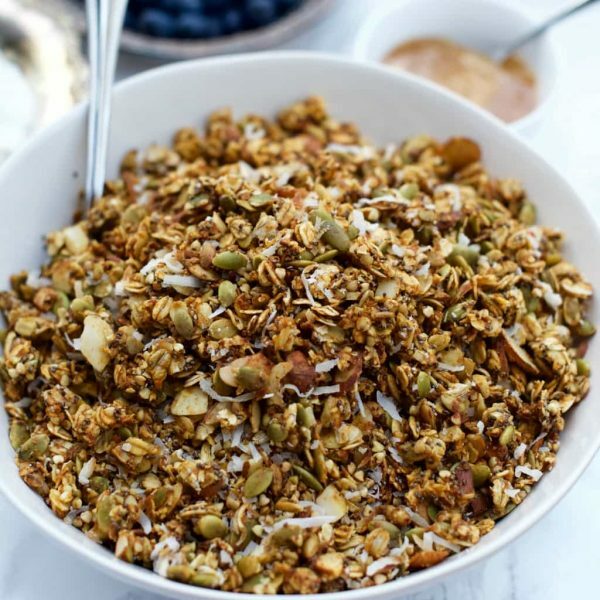 A perfect breakfast or hiking snack, Gluten-Free Cinnamon Sweet Potato Granola, made with baked sweet potatoes. Also a great hospitality or holiday gift! 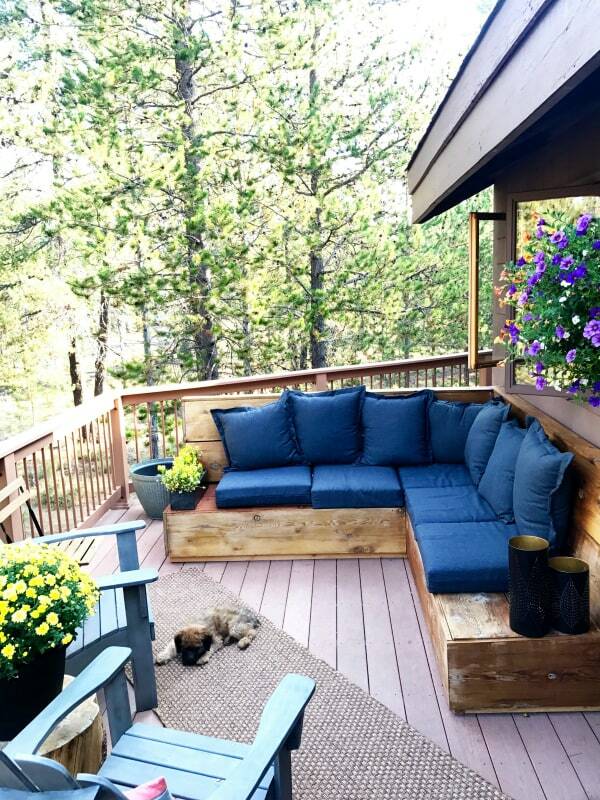 Friends, let’s talk deck patios. Since the weather has been hotter than normal here in central Oregon, we’ve been enjoying all our meals outside. At breakfast, we gather our food and enjoy the back of the house. I have to say though that the fires surrounding us are worrisome. And folks, we are surrounded here in central Oregon. It’s always great news when they don’t cross the river, and even better news when the rains come. We pray for all the firefighters keeping us safe right now! The one good thing, is beautiful sunsets. 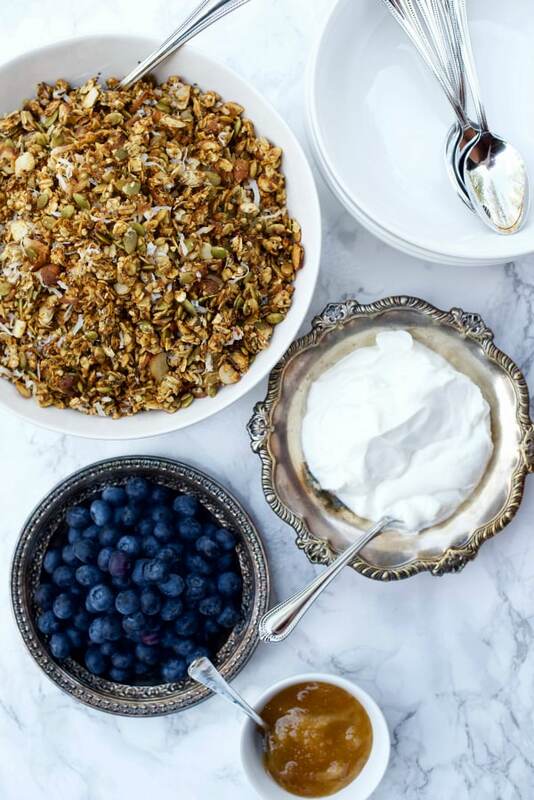 With a hint of autumn in the air, today I’m sharing a delicious Gluten Free Cinnamon Sweet Potato Granola, a recipe you can make ahead and enjoy all week long. You can store it and serve parfaits to weekend guests! Bake the sweet potatoes ahead of time, and mash them with a fork. BAKE SWEET POTATOES: Scrub potatoes and pierce with a fork. Line a baking sheet with foil; place the potatoes on top. Bake for 45 – 60 minutes at 400 degrees, depending on the size of the potatoes. Bake until soft and squishy. Remove from heat and allow to cool. Then add buckwheat, pipettes, gluten free oats, chia seeds, and slivered almonds into mashed sweet potatoes. 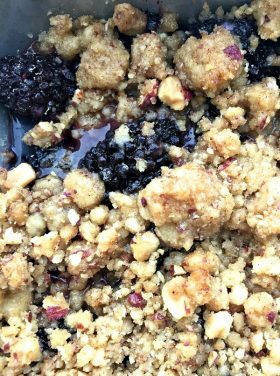 This granola is not very sweet (which we really like), so if you like it sweeter, just add more sugar (or honey). Follow instructions; bake, cool, serve! A great snack, and PERFECT for your gluten-free friends! We just may take it on the hiking trails this week (if the air clears – again, our fires are very serious in our area). To bake sweet potatoes: Scrub sweet potatoes and pierce in several places with a fork. Line a baking sheet with foil; place the potatoes on top. Bake for 45 minutes to an hour at 400 degrees, depending on the size of the potatoes. 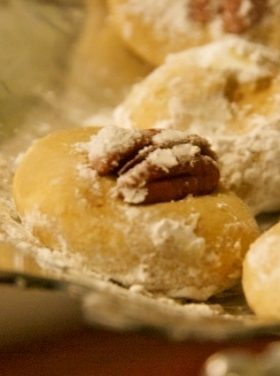 Bake until soft and squishy. Remove from heat. In large bowl, mash the baked sweet potatoes. Add oil, cinnamon, vanilla, and coconut sugar. Mix completely until smooth. Add buckwheat, pepitas, gluten free oats, chia seeds, and slivered almonds into sweet potato puree. 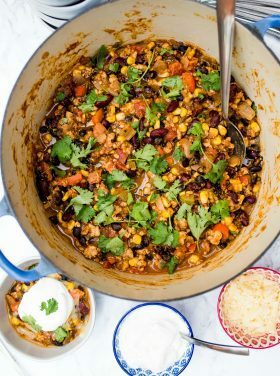 With large spoon or hands, combine wet and dry ingredients. 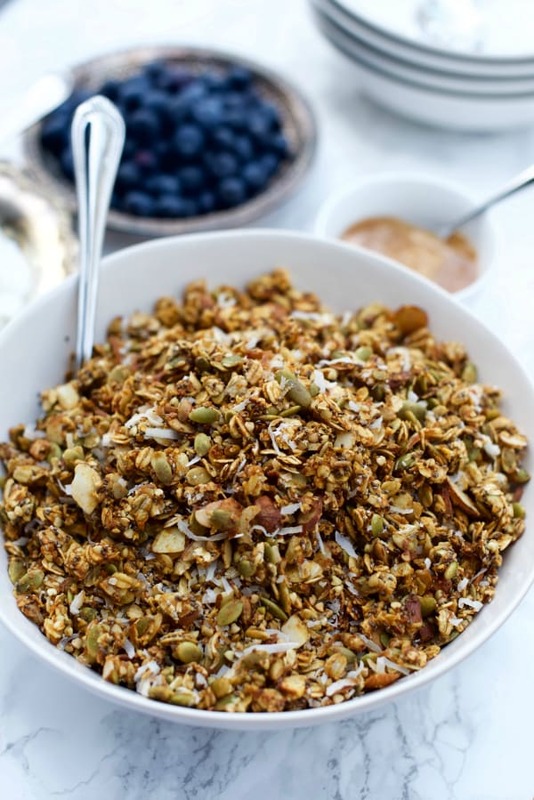 On foil-lined, greased baking sheet, spread granola evenly. Bake in oven for 17-20 minutes. 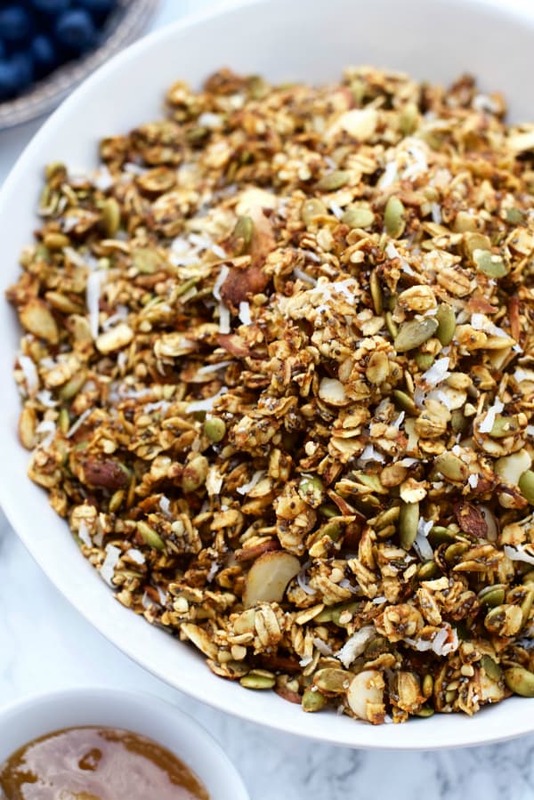 When time is up, flip granola, add coconut, and return to oven for additional 15-18 minutes. 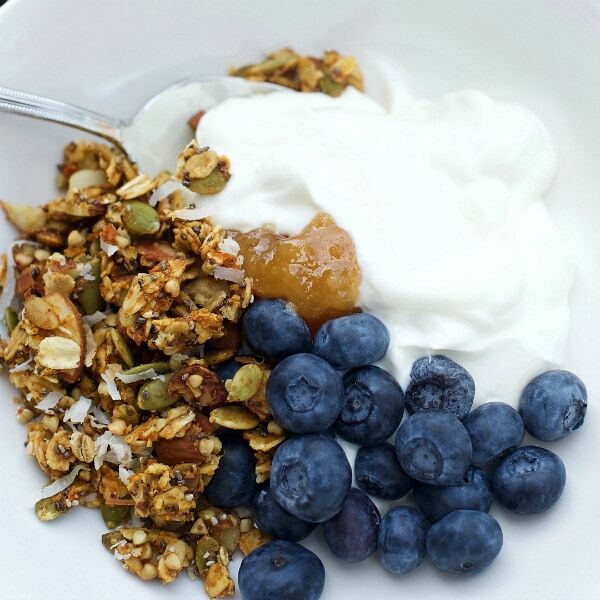 If you prefer sweeter granola, add additional sugar. 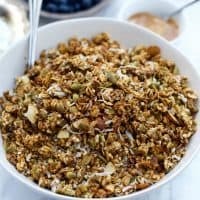 More granola recipes: Almond Butter Granola [Two Peas and Their Pod], Blueberry Granola Crunch Muffins, and Maple Walnut Granola [Baker Mama]. Curious about texture, too. Does it get crunchy? Thank you! Yum. I just made granola because I was craving it. This sounds good. Does it get crunchy or is it softer? My hubby would like it because he’s not a sweet fan.